27 Mtpa of capacity in three of the other four terminals are US-based projects with Venture Global’s 10.8 Mtpa Calcasieu Pass, Cheniere’s 4.5 Mtpa Sabine Pass T6, and Tellurian’s 11 Mtpa phase 1 of the Driftwood LNG project all talking up a 2019 FID. All of these seem likely, but really represent the main large US projects we think will be likely to progress to construction in both 2019 and in 2020. The only other project we expect to see an FID on in 2019 is ExxonMobil’s 15.2 Mtpa Mozambique Rovuma project, which has signalled an FID as the project partners (Eni, Kogas, and Galp) are all agreeing to be offtakers. There are a number of other FIDs that could be taken in 2019 (<50% chance) but are more likely to slip into 2020. 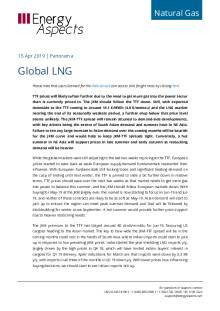 Of the world-scale projects, the 12 Mtpa Mozambique LNG project led by Anadarko, Novatek’s 20 Mtpa Arctic 2 LNG and ExxonMobil’s 8.1 Mtpa Papua New Guinea expansion project are heading the list. What this raft of advanced projects does suggest, is even against a background of softening prices, another supply wave will be triggered that will be breaking on the LNG market from around 2023 or 2024. With JKM prices having seen good support through the last two years, interest in new regas projects has cooled, and we do think the lower price environment expected in 2019 could well result in a reignition of demand-side interest this year. That said, there is a concentration of new project interest in Asia, but outside of that region, it is harder to know exactly where such demand interest might arise. While China’s LNG appetite is clear, its 2019 regas additions are limited to just over 4 Mtpa and while 2020 sees it add 16.5 Mtpa, all of that is going to come in at the end of that year. From a new regas perspective, South Asia already boasts a slate of new projects that have been announced or are under construction. India is in the lead here with some 17 Mtpa of new regas capacity expected to be coming online (and 11.5 Mtpa of that expected in H1 19) in 2019. How fast these projects will ramp up, as always with India, depends on related infrastructure, especially downstream pipelines, so even then, demand is far from certain to quickly materialise.